"When you fast, don't make yourselves look sad. The hypocrites do that. Don't be like the hypocrites. They make their faces look strange to show people that they are fasting. I tell you the truth, those hypocrites already have their full reward. So when you fast, make yourself look nice. Wash your face. Then people will not know that you are fasting. But your Father that you cannot see will see you. Your Father sees the things that are done in secret. And he will reward you." We do not pursue the spiritual disciplines to gain us notoriety and respect. They are of value when we offer them to God and go about our daily routine as if nothing were different, except our character. Our character is to be transformed to be more like our Father in Heaven. 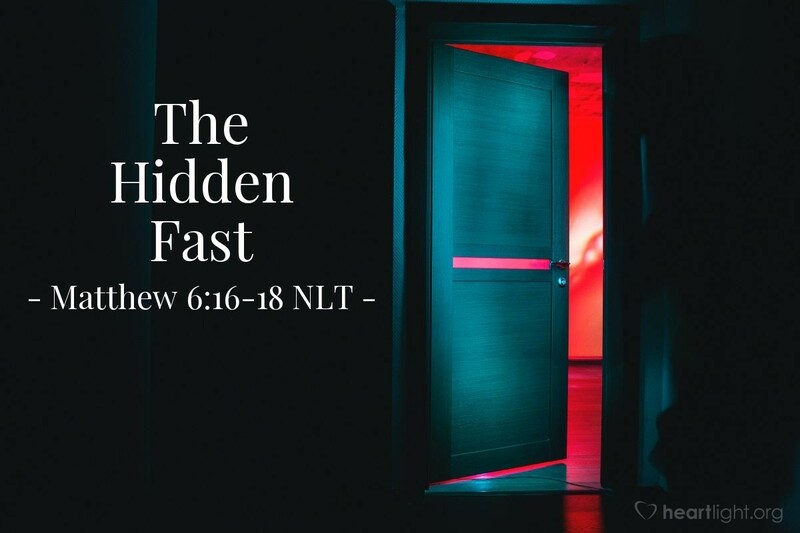 A fast to God is not about looking like we're fasting on the outside, but that we're being transformed on the inside. That transformation will show itself over time, and in the meantime, the fruit of fasting will be its own reward. Loving Father, I recognize that every good thing I have comes from you. Thank you for being so generous. I especially enjoy the food you provide for me each day. As I fast, please help me to base that fasting in the thankfulness for all you have done for me and please use it to form in me more of your character than I had yesterday. In Jesus' name I pray. Amen.